Polly Parsons, MD, will serve as president of the ATS for the 2018-2019 term. 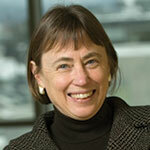 She is the E. L. Amidon Professor of Medicine and chair of the Department of Medicine at the University of Vermont. Q: Do you remember your first ATS International Conference? A: I attended my first ATS International Conference when I was a fellow at the University of Colorado. It was clear that the ATS was the professional “home” for the faculty in Colorado, and I was thrilled that first year to have a poster accepted for presentation. The program was filled with luminaries in the field—it was exciting, and a bit intimidating. I was incredibly nervous about presenting my poster even though I had been well prepared by my mentors. In the days prior to my session, I attended others where there was vigorous debate and probing questions, and I wasn’t sure what to hope for: that no one would stop by and ask questions or that my poster would generate a lot of questions, even if I couldn’t answer them all. Q: How did your presentation go? A: My fears were unfounded. People with names I recognized as leaders in the field graciously asked me to tell them about my work. They did ask questions, but it was an interactive dialogue with strong encouragement for what I was doing. Q: Did that experience convince you that the ATS was also your professional home? A: I have attended the ATS almost every year since then, missing only for events such as the birth of my oldest son. As a fellow, I saw the ATS as a place to present my work, hear about cutting-edge science, and begin to develop colleagues and collaborators beyond my own institution. Early on as a junior faculty member, I became involved in my assembly and was invited to serve on an ATS committee. Those opportunities expanded my network of colleagues, allowed me to contribute back to the ATS, and provided ongoing leadership experience. Q: Why did you want to become the ATS president? A: Being president of the ATS is an extraordinary honor and responsibility. It is not actually a position that I spent my career planning for. When I was a fellow and junior faculty member, the ATS presidents were the senior statesmen and women in the field, far ahead of me in their careers in roles that seemed distant, like professor, division chief, department chair, or medical school dean. Over time, colleagues with whom I had grown up professionally began to assume leading roles in the ATS, and I realized that I, too, might be able to give back to the organization that gave me so much. The ATS is a strong organization built on a foundation of extraordinary staff and volunteers who dedicate tremendous time and expertise to ensure its success. It is a privilege to be able to serve the ATS. Q: From cutting federal support of health care to rolling back clean air regulations, the current administration in Washington often champions policies that the ATS opposes. What is the ATS doing to ensure that the voices of its members and, more importantly, the patients they serve, are heard in the nation’s capital? A: The ATS tagline, “We help the world breathe,” reflects our core mission. Nationally and internationally, the ATS is known for advancing respiratory health through its commitment to science and the dissemination of new knowledge. The ATS has a strong voice in our nation’s capital through our advocacy program led by Gary Ewart in our Washington office. The ATS Executive Committee meets regularly with senior leaders at the NIH, EPA, FDA, and other key organizations; members of ATS provide testimony to Congress on key issues; and the ATS pursues court actions. In addition, Gary and his colleague Nuala Moore organize Hill Day events, during which ATS leaders and members visit Congressional leaders to advocate for all aspects of respiratory health—from scientific funding to clinical care. The impact of these visits are magnified by the presence of the ATS Public Advisory Roundtable representatives who directly bring the voice of our patients into the conversations. Members of ATS Chapters are also actively involved in the advocacy efforts, and each year the number of chapters increases, which provides more opportunities for regional and state advocacy. The ATS also advocates internationally through the Forum of International Respiratory Societies, which continues to emphasize the global burden of lung disease. Q: At the end of your presidency if you could be known for one thing, what would it be? A: I think that’s the wrong question. The ATS is much bigger than its president. I hope the ATS continues to be known as the leading society for the advancement of lung health. My colleagues on the Executive Committee and I work as a close-knit team and are focused collaboratively on broad initiatives to enhance the value of ATS for each of its members and sustain the growth and success of the organization. This will also be a year of leadership transition beyond the transition of the presidency from Marc Moss to me. Steve Crane, the ATS executive director for more than 10 years, is retiring, and we welcome Karen Collishaw to the organization. We will miss Steve’s expertise and steady hand on the tiller (he is a sailor! ), but it is also exciting to welcome someone new to the organization who will bring new ideas and opportunities.